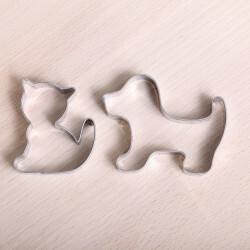 Cookie Cutter Sets There are 25 products. 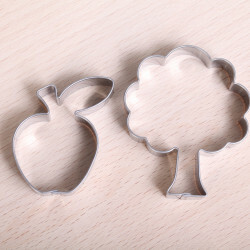 Cookie cutter set 'Springtime'. 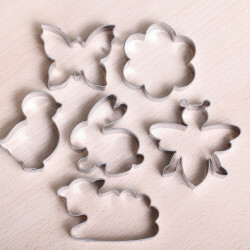 This six piece cutter set, made of high quality stainless steel, contains a little lam, hare, chick, butterfly, little bee and a flower. Dimensions between 5 and 6 cm. 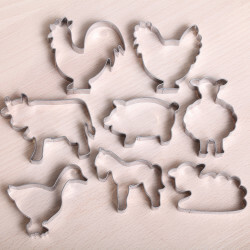 Cookie cutter set 'Farmyard Animals'. Made of stainless steel. Set of 8 cutters. 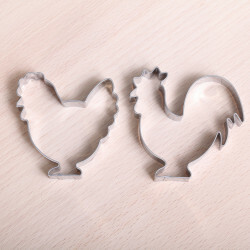 Cookie cutter set with 3 egg shapes. 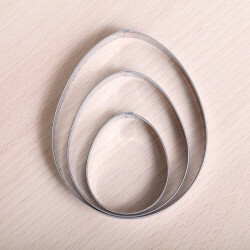 This three piece cutter set is made of high quality stainless steel. The eggs measure 5, 7 and 9 cm. 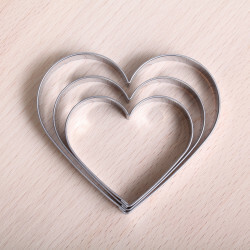 Cookie cutter set with 3 heart shapes. 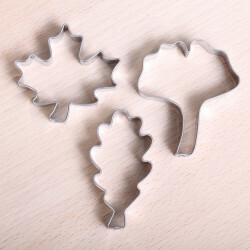 This three piece cutter set is made of high quality stainless steel. The hearts measure 5, 6 and 7 cm / 2, 2.4 and 2.7 inches in length. 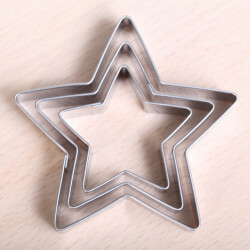 Cookie cutter set with 3 star shapes. This three piece cutter set is made of high quality stainless steel. The stars measure 4.5, 6 and 7.5 cm / 1.7, 2.4 and 2.9 inches. These stars have 5-points. 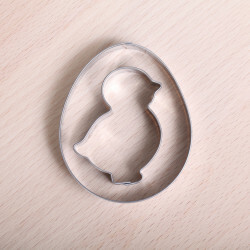 Cookie cutter set 'Easter'. 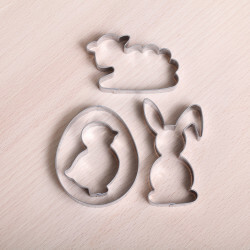 This 4 piece cutter set, made of high quality stainless steel, contains a little lam, hare with floppy ear (cookies can be hooked on rim of your mug), chick and egg. Dimensions between 5 and 7.5 cm. 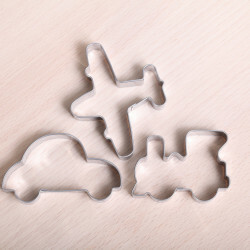 Cookie cutter set 'Little Cottage'. 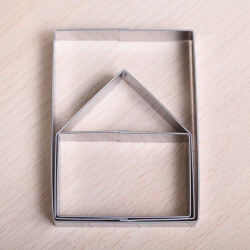 This three piece cutter set, made of high quality stainless steel, has a piece of 8.5 x 6 cm used as a floorboard, a piece of 6.5 x 6 cm for the front and back and a cutter that measures 6 x 3.5 cm for the walls and roof. 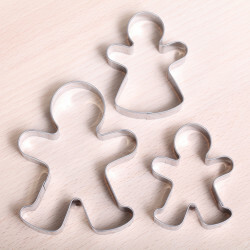 Cookie cutter set 'Basic Shapes'. 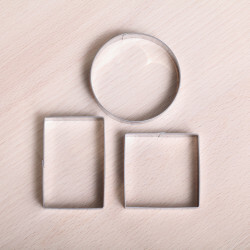 This three piece cutter set, made of high quality stainless steel, consists of a circle (6 cm), square (5 x 5 cm) and rectangle (6.3 x 4 cm). 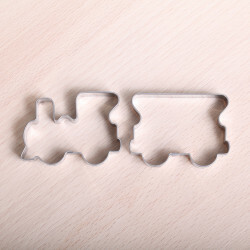 Cookie cutter set 'Transport'. 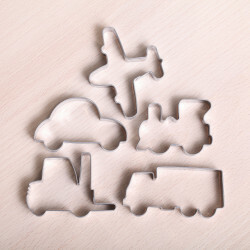 This five piece cutter set, made of high quality stainless steel, contains a locomotive, airplane, car, truck and forklift. 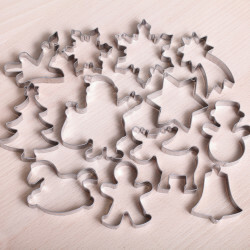 Cookie cutter set 'Winter Cookie Fest'. Made of stainless steel. set of 8. 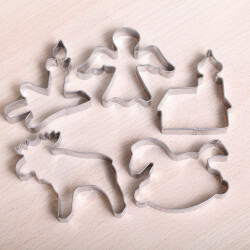 Cookie cutter set "Santa's big cookie Christmas'. Made of stainless steel. 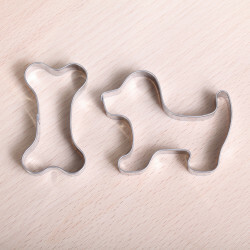 Set of cute12 cutters. Santa, a funny moose, snowman, ice crystal big and small, gingerbread man, Christmas tree, star, shooting star, rocking horse, Christmas bell and light. Measurements 5 to 8 cm / 2 to 3.1 inches. Save 25% compared to piece price. 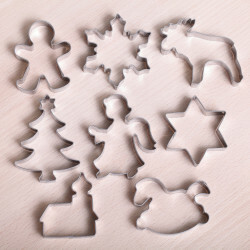 Cookie cutter set 'Autumn Cookie Fest'. Made of stainless steel. Set of 10 different shapes. 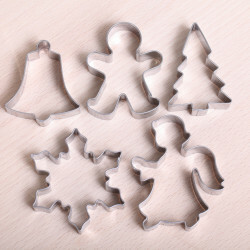 Cookie cutter set 'Tools'. 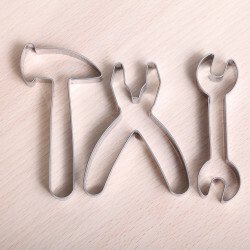 This three piece cutter set, made of high quality stainless steel, contains a hammer, pliers and a wrench.